Dive the Garden Route: Mossel Bay, Knynsa, Plettenberg Bay( Plett ) and Port Elizabeth all boast fantastic dive sites and a good diving infrastructure, however the diving potential of the Garden Route is often overlooked by visitors and it hardly seems fair that the local divers are allowed to keep these treasures to themselves. The Garden Route is a densely vegetated coastal plateau of fynbos (fine bush) and forest set between spectacular mountain ranges to the north and a rugged coastline of cliffs and and beaches to the south. The natural beauty of the region is only surpassed beneath the waves. Garden Route dive sites: Truly a garden route underwater, the dive sites of the Garden Route are a macro photographers dream. Prevailing summer SE winds cause plankton to bloom. Invertebrates thrive in these temperate (14 – 24 degrees) nutrient rich waters, so don’t be put off by comparatively low visibility – if you don’t get the big picture there’s a whole world beneath your nose. 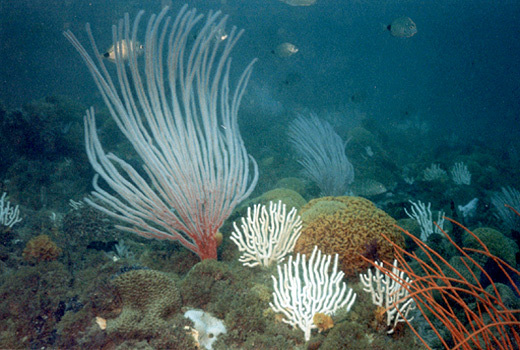 Forests of gorgonian fans are littered with basket stars and huge orange wall sponges flow across the contours. Anemone gardens abound and jewel anemones sparkle from the darker recesses. 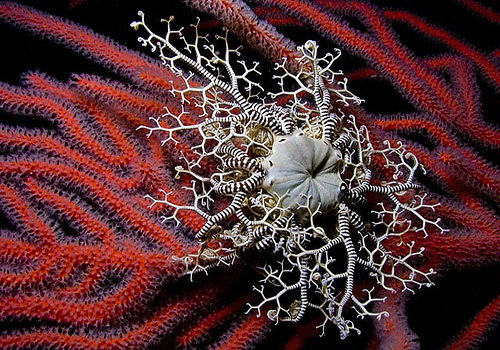 Cup corals and feather stars, brittle stars and nudibranch, sea hares and pipefish, horsefish, shy sharks and occasionally larger sharks complete the scene. Change your focus and these dive sites soon become world class. Shark Diving on the Garden Route: Many of the dive sites along this coast boast regular sightings of ragged-tooth sharks as well as several smaller species of cat-shark found amongst the reef and hiding in caves. 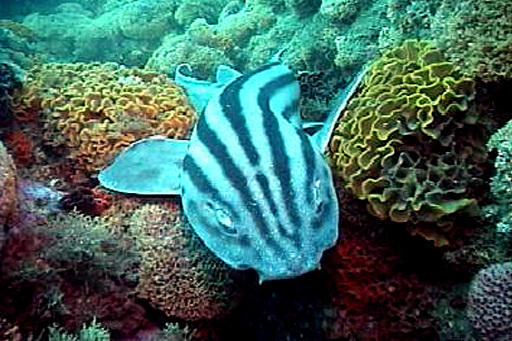 Occasionally larger sharks such as white sharks, mako, thresher and bronze whalers are sighted cruising the reef fringes, however these encounters are rare without baiting. Mossel Bay does however offer a fantastic cage diving option for those travelling this coast either to or from Cape Town.